And Ansha is expecting her third child. What should be a joyful prospect is frightening as Ansha’s sight fades. “To become blind would be horrible. That would mean to have no future, to be unable to look after my children, or to work. What would become of us? 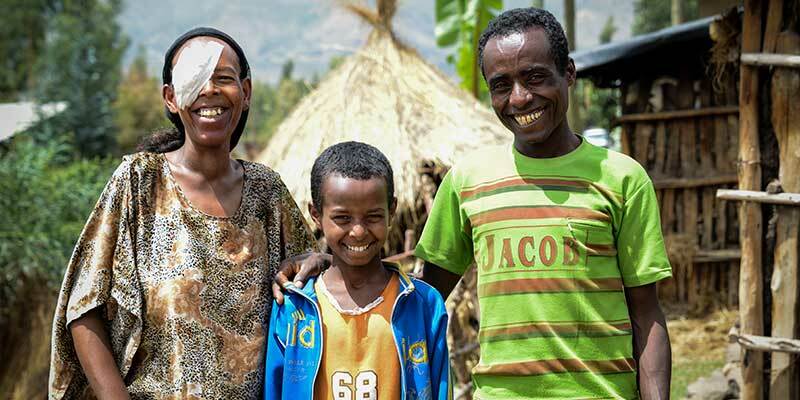 Trachoma is a brutal disease. It starts off like conjunctivitis (pinkeye) and ends up – after years of painful and repeated infection – with eyelids turning inwards. Eyelashes scrape over the surface of the eye. Every blink is painful. Every blink scratches the cornea. Light becomes intolerable. Every few months, Ansha would painstakingly pluck out her eyelashes one by one. At first she did it with her fingers. Then she bought tweezers, known locally as Werento. For Ansha, Werento is like medicine. Left untreated, this condition leads to corneal scarring, opacities and finally irreversible blindness. Ansha and her husband Kasim are peasant farmers. They grow teff (used for the Ethiopian injera dough – a staple food in Ethiopia), barley, wheat and some vegetables. Most of it is used to sustain them; a small part is sold on the market. They don’t have any furniture in their small hut, just a few mats to sleep on. “We have to work on the field every day to survive. But when the pain in my eyes became stronger and stronger, I couldn’t work well anymore. I was really worried. The field and our oxen are our whole existence”, Ansha tells us. When we found her, Ansha urgently needed surgery to rotate her eyelids back outward, to stop the scraping and the scar build-up – to protect her sight. Thanks to generous supporters, just over a year ago, she got the surgery. The ultimate solution for Ansha and her family, though, is water. Access to an adequate amount of clean water. Without water, the problem will come back. Without water, Ansha’s children are still at risk.